A quiet walk in the New Hampshire woods reveals many well kept secrets. Rows of stone walls running along old farming and logging roads. Maple trees lined up with buckets collecting nature's goodness, and small sugar shacks nestled deep in the woods. Maple Sugaring is as old as our country itself. While its origin is unknown, it is said to have been discovered by Native Americans. It was then shared with the settlers in northern New England. Today maple syrup is made in the Northeastern United States and Southeastern Canada. The maple sugaring season usually lasts 4-6 weeks depending entirely on how long the weather cooperates. 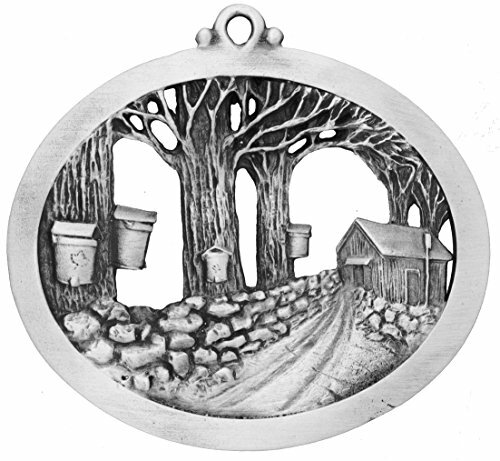 In New Hampshire, approximately 3.6 million gallons of sap are collected each year to produce 90,000 gallons of pure New Hampshire maple syrup. If your travels bring you to New Hampshire early in the spring, take the time to explore the maple sugaring secrets hidden deep in the woods. 3 3/4" x 2 1/2"